Version 8.0 is coming to you on April 3rd! Here's what you can look forward to! CELEBRATE THE TRANSFORMERS: FORGED TO FIGHT 2 YEAR ANNIVERSARY WITH THIS EXCITING NEW UPDATE! - A new Challenge Mission has arrived! Conquer this new challenge to gain exclusive rewards. But hurry! You only have 2 Weeks! Alliance Mission Maps have been reworked. - Map 3 difficulty and rewards have been increased to provide an engaging challenge for the top level Commanders. - Map 3 layouts and encounters have been updated. This means all new enemies, bosses, and buffs to overcome! - Map 1 and 2 Bosses and Mini-Bosses have been updated. • Added +3.6% to base Critical Rate. • The time it takes to switch ammo has been reduced to 60ms, down from 90ms. • Increased Signature Ability scaling to start at +50% projectile damage. This scales to an unchanged maximum of +200%. • The bonus from Hound’s Signature Ability remains activate during Special Attacks that activated before the bonus expired. • Increase Critical Damage against Burning opponents. • The Critical Resistance Debuff now scales up, gaining +0.5s duration and -1.8% potency each Rank. • The increased Critical Damage against Burning targets now scales up +5% with each Rank. • The final (grenade) hit of Special 2 inflicts Burn instead of Bleed. • Sidestepping while Precision Ammo is equipped Purifies Dazed effects. • Added +10% Attack to Inferno Ammo heat damage at all Ranks and now all damage is dealt after 10s instead of 15s. • The chance to trigger an Acid Debuff on projectile attacks starts with +5% chance and scales up an additional +5% with each Rank, up to a maximum of 50% at Rank 5. • The Acid Debuff from projectile attacks lasts +1 second longer at all Ranks. • Added +10% Attack to Acid Damage from projectile attacks at all Ranks. *** Acid is one of the unique aspects of Mixmaster but wasn’t relevant enough in most fights. These changes make it more worthwhile and reliable to leverage ranged gameplay to generate this unique effect. • Added +8% base Block Proficiency. • Added +3% to base Attack. • Added +5% to base Block Proficiency. • Increased the duration of his Ranged Bonus from 10s to 20s. 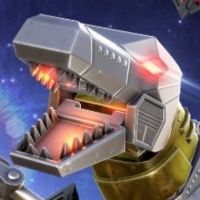 • The Old Friends Synergy with Starscream is now part of Jetfire’s base kit; however, the Stun from well-timed Blocks no longer affects Special Attacks and the Stun duration has been shortened to 1s. The Synergy still exists, but has the new effect of increasing the duration of this Stun from well-timed Blocks by 50%. *** It was never intended to let any Bot inflict Stun to an enemy during that enemies’ Special animation. This has led to several issues, and breaks a rule of gameplay in an uncomfortable way. This Synergy with Starscream was so potent that it made Jetfire feel reliant on a specific team. We’ve kept a Synergy between them, but Jetfire is now more viable on non-Starscream teams. • Added +3.6% base Critical Rate. • Added +10% base Critical Damage. • Special 2 Critical (blade) hits now inflict Bleed. • Special 1 chance for a Projectile Damage Buff increased to 100%. • Projectile Bonus duration increased by 2 seconds. • Special 2 Armor Break now has a chance to trigger on both hits and lasts 2 seconds longer. *** The extra hit of Armor Break is an additional chance to remove an enemy Armor Up. This Armor Break is now more in line with what to expect from a Special 2, and from a Tactician Bot. • Starscream’s Old Friends Synergy with Jetfire no longer plays a Sidestep animation to avoid projectiles when Starscream dashes back. Instead, projectiles miss. He still receives the Critical Damage Buff when a projectile misses during his Dodge. • Increased the chance to trigger a Dark Burn from Heavy Attacks by 0.7% per charge of Dark Energy. At 30 charges, the chance to trigger a Dark Burn is 51%, up from the previous 30%. • Added 10% Attack to Dark Burn damage at all Ranks. • The Purify from his Signature Ability activates after 1 second, down from 1.5 seconds. • Special 3 Critical (missile) Hits inflict Burn like other missile attacks. • Added +10% to base Critical Damage. • Special 2 chance to Burn increased to 100%. • Increased all Critical Rating Buff durations by 2 seconds. • Increased all Armor Break durations by 2 seconds. • Added +10% chance to Special 1 Armor Break at all Ranks. • Added +5% base Block Proficiency. • Increased Signature Ability scaling to 15...50% chance of Unblockable. • Special 1 now has a 40..60% chance to inflict an Armor Break Debuff on each hit based on Rank. • Removed 2% base Health. • Removed 4% base Attack. *** We recognize Megatronus as one of the most effective Bots. We don't want to dethrone him, especially after many of you have worked hard to acquire and upgrade him. We've reduced his overall effectiveness a bit by targeting his core stats, which ensure none of his unique functionality is compromised. • The Power Steal from well-timed Blocks increased to 2...8% based on Tier. • Updated to actually subtract Power from the opponent by an equal amount.